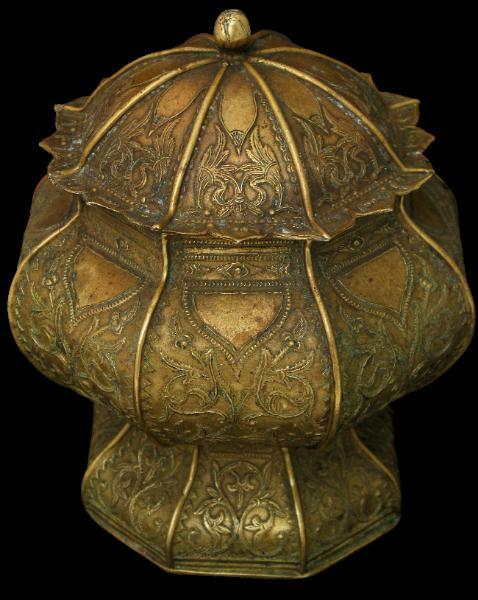 This lidded, eight-sided container of pleasing proportions is in the tradition of Malay lost wax brass work seen across the Malay world from Sumatra, to the Malay peninsular, Borneo and the southern Philippines. It also incorporates Chinese elements – the form is reminiscent of a Chinese porcelain waisted ginger jar whilst the motifs are Malay and localised Islamic in styling with Iban elements. 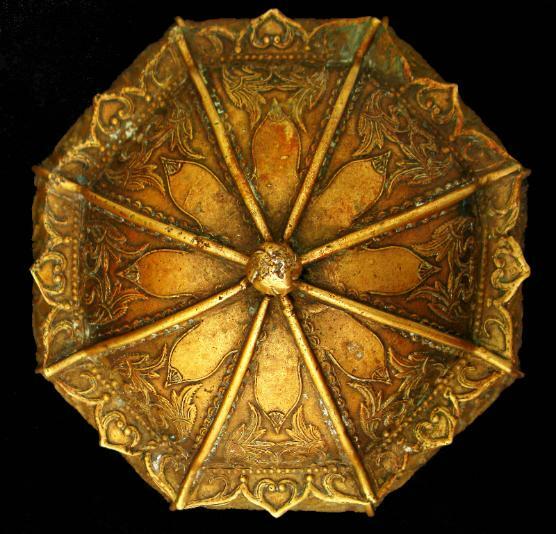 Such a combination is typical of the brass and other work of Brunei and Sarawak where trade routes saw many Chinese elements become incorporated into local work. Children’s stories that are still told in Brunei and Borneo feature tales of Chinese princes and dragons. One tells of a dragon that lives atop Mount Kinabalu (Borneo’s highest mountain) where it guards a magnificent precious stone the size of a peacock’s egg. The Emperor of China hears about the stone and tells his three sons that whichever one of them brings back the stone will be made his heir; the other two will be killed. One son manages to trick the dragon and captures the stone. But the other sons lie to their father that they were the ones to take the stone. Ultimately, the Emperor discovers this deception and the wayward sons escape China, one of whom returns to Brunei and founds a princely dynasty there. The lid fits tightly and has eight panels or sides, separated by prominent ribs, to match the base. The rim of the lid is in the form of flower petals not unlike those of a sunflower. 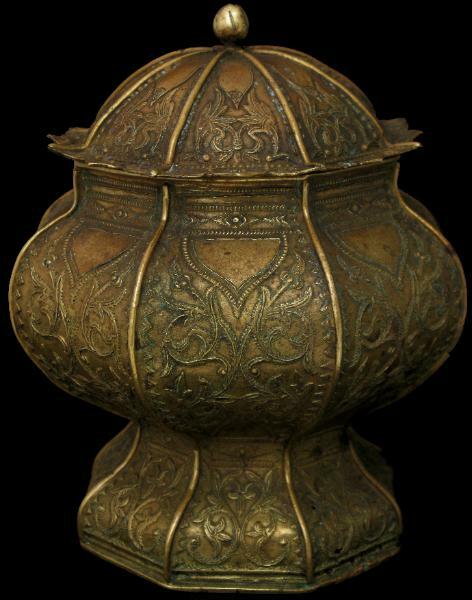 a brass jar of this form is illustrated in Chin, L., Cultural Heritage of Sarawak, Sarawak Museum, 1980, p. 48.